No other artist currently active in Poland has demonstrated the same ability to captivate the public in quite the same manner as Tytus Brzozowski. But though primarily known for his surreal, Warsaw-inspired watercolors, the last few months have seen the artist expand his portfolio in a most literal sense. 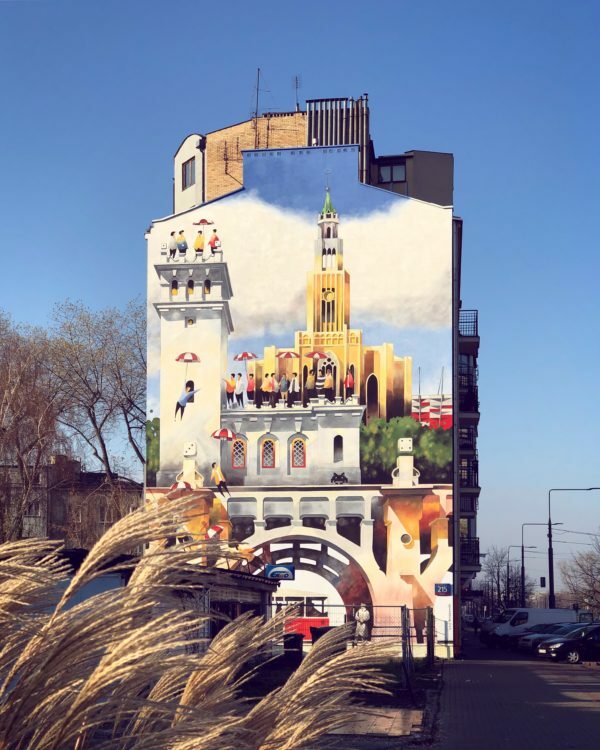 Having recently super-sized one project to feature on the side of a Wola skyscraper, November saw Brzozowski return to the limelight with a second large format wall mural, this time situated in the vicinity of Rondo Wiatraczna on the city’s right flank. Found on Grochowska 215, the mural was commissioned as part of the country’s Independence Day celebrations, with the artist riffing on a variety of themes honoring historic events related to those times. “The painting,” says Brzozowski, “shows characteristic elements of the Praga Południe district and scenes linked to the centenary of Polish independence. Among the strollers pictured you can make out Marshal Józef Piłsudski examining modern Warsaw, while close by you’ll see a tram so typical of the terminal at Wiatraczna – the tram’s number, 24, is in itself meaningful as this was the first connection running to the district of Gocławek. Of the other landmarks, the piece features the soaring spires of the inter-war church on Pl. Szembeka towering over the rolling greenery of Skaryszewski Park, as well as the state-of-the-art National Stadium, an arena that Brzozowski points out has been vital to the rehabilitation of Praga Południe’s image. Simultaneously, the work is lent added impact with the inclusion of signature flights of fancy so associated with the artist: a Space Invader, unexplained dice and numerous individuals floating through the sky with the aid of red-and-white umbrellas.